We study human cognition, action and interaction on scales ranging from individual experience, through interactions between individuals, to the languages, cultures and dynamics of societies. Including: Conversation Analysis, Discourse Analysis, Robotics, Cognitive Modelling, Machine learning, Formal Modelling, Computational Linguistics, Empirical studies of brain and behaviour. 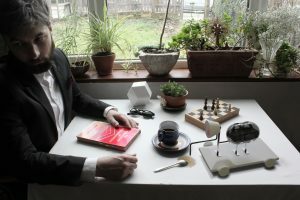 Last year Paul Curzon and Peter McOwan published “The Power of Computational Thinking: Games, Magic and Puzzles to Help You Become a Computational Thinker“. Following the Chinese translation earlier this year, the book was recently translated to German by Bernhard Gerl and published by Springer-Verlag Berlin Heidelberg. EECS academics in partnership with colleagues in Learning Development have written a chapter for a new Bloomsbury publication – “Computer Science Education: Perspectives on Teaching and Learning in School” edited by Sue Sentance at King’s College London. “Teaching Computing Concepts” by Paul Curzon, Peter McOwan, James Donohue, Seymour Wright and William Marsh (all Queen Mary University of London) draws on their experience both of teaching undergraduate students at QMUL as well as CPD support (through courses, workshops and resources) for computer science teachers and their public engagement work. Their teaching methods include the use of ‘unplugged’ activities, such as magic tricks, which introduce computing concepts in a fun, inspiring and accessible way. Curzon, McOwan and Marsh from QMUL work closely with Sentance (KCL) as part of CAS London Regional Centre, a university-led, Government-funded project to support computing teachers through the Computing At School (CAS) network. The EECS-based CS4FN (Computer Science For Fun) magazine and website have been supporting computing students (and teachers) for over 10 years and Teaching London Computing is its sister portal providing resources for teachers. 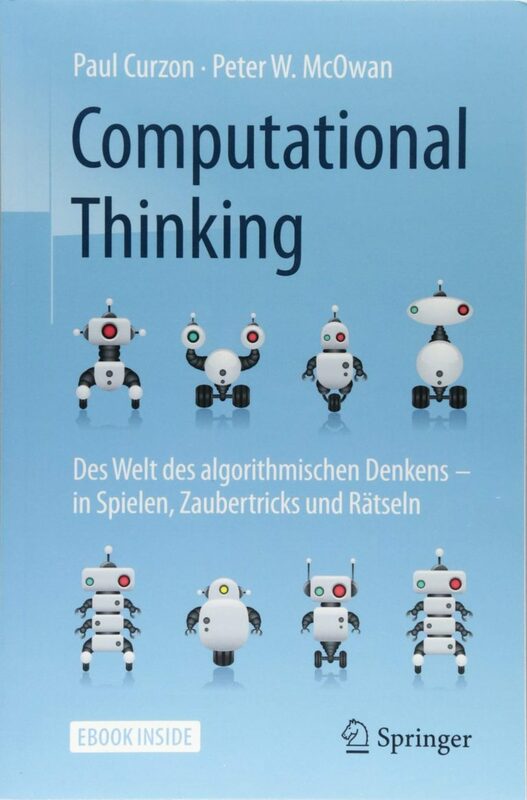 In 2017 Paul Curzon and Peter McOwan published “The Power of Computational Thinking: Games, Magic and Puzzles to Help You Become a Computational Thinker” based on material, ideas and approach from CS4FN. This has now been translated into Chinese by a Taiwanese publisher as a result of the strong following of CS4FN in Taiwan. Artificial intelligence and robotics will play an increasingly important role in supporting our lives. Currently, AI and robotics remain crude – confined to our smartphones, sat-navs, or tasked to build our cars. To fit more seamlessly into our daily lives they will have to learn to successfully reflect our emotions – the embarrassment for example. Embarrassed Robots project proposes an investigation into how through material, form and function a robot can come to express emotion, without aping and alienating us. Embarrassment is a quintessential human emotion and something that in the future any robot occupying a human facing role will need to be able to replicate. 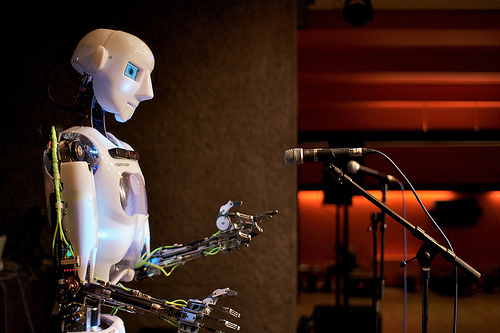 This project proposes an investigation into how the design of a robot can come to express embarrassment. This speculative design project is currently developing by Soomi Park at the Design Museum as one of Designer in Residence projects of this year. More info on the project website. 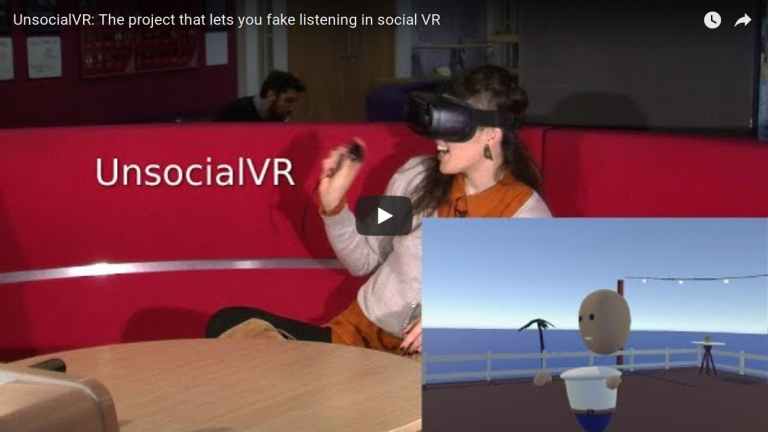 UnsocialVR, Tom Gurion’s advanced project placement, checks what it takes to fake listening in virtual environment. By pressing a button you can let a set of automating behaviours take control over your avatar, and move away to do something else. TileAttack! is a game-with-a-purpose (GWAP) designed to gather annotations for text segmentation. The current application is labelling mentions for anaphoric corpora. Chris Wood, a Media and Arts Technology PhD Student here at Queen Mary, recently received a Best paper award at Designing Interactive Systems (DIS). The conference was held from 10-14 June in Edinburgh, UK. There were 5 winners in total, which were the top 1% of submissions. Soomi Park selected for the Design Museum’s Designers in Residence programme! Soomi Park, a London-based designer and Media and Arts Technology PhD Student here at Queen Mary has been selected as one of four designers for the Design Museum’s Designers in Residence programme. Her ‘Embarassed Robots’ project will look at how robots can potentially reflect complex human emotions and what this could mean for the future of artificial intelligence. Read more about it here! On Tuesday 7th February 2017 Steve Reich’s Clapping Music won the Involvement award at the QMUL Engagement and Entrepreneurship Awards, in the category of Public Engagement. Steve Reich’s Clapping Music is a free iPhone/iPad app designed to engage audiences with a new music genre, using a novel interactive game-based approach. Players learn to play an iconic minimalist composition, Clapping Music by Steve Reich. Information on the research is available here. Information is available on various scholarship schemes at Queen Mary, open to PhD applicants from a variety of countries. Click here for more details. As SysMus enters its 10th year, come and celebrate with us in London! SysMus17 is coming September 13th-15th 2017 and will be hosted by the Music Cognition Lab at Queen Mary. Invitations are open for presentations in the form of live spoken papers, virtual spoken papers and poster presentations. The deadline for submitting is June 30th, 2017. Visit the site for more details and read the call for papers here! 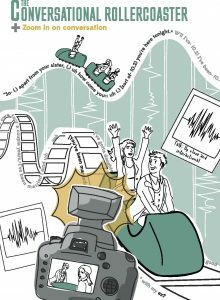 The Conversational Rollercoaster: Get your conversation analysed at New Scientist Live! Language and interaction scientists from around the UK will gather at New Scientist Live in London’s Excel Centre to put visitors’ interpersonal interaction under the microscope by analysing conversations between visitors as they happen. Conversation analysts usually take months or even years to record, transcribe, analyse and write-up their results, but for New Scientist Live, a team from Queen Mary’s Cognitive Science group and Loughborough University’s Department of Social Sciences has developed a new demo format they are calling the ‘Conversational Rollercoaster’ that will speed up the process. While visitors join in spontaneous discussion hosted by the pop-up talk-show ‘Talkaoke’, the analysts will be hard at work recording, studying and presenting research findings about visitors’ conversations as they talk. 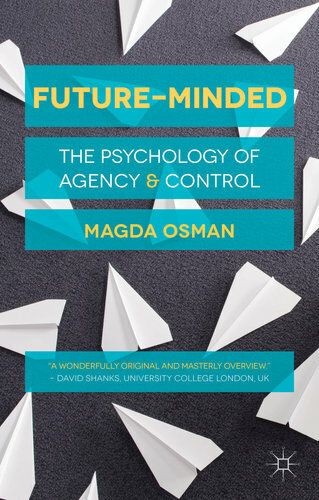 “The idea is to reveal the amazing ways people use all the time to manage the unpredictability of their everyday interactions – so they can join in and talk, then step off the ‘conversational rollercoaster’ and see a snapshot of the amazingly intricate thing they just did effortlessly – without even thinking about it – in a new light”: Elizabeth Stokoe, Professor of Social Interaction at Loughborough University. “It’s like a mix between a live reality talk-show and football commentary, where you have all this spontaneous action in the conversation, then immediate expert analysis – except hopefully with fewer sports clichés”: Saul Albert, main organizer from Queen Mary’s Cognitive Science research group. … including words for swearing, religion and uncertainty! The researchers sampled tweets from followers of major Democrat and Republican accounts, and found that party affiliation had some interesting correlations with the language people use. As well as differences in propensity to swear or mention religion, they found differences in emotional content, levels of uncertainty and pronoun use, with liberals more likely to refer to themselves and conservatives to refer to group identity. Here’s what The Guardian, the Daily Mail, the Scientific American and others have to say! What do knitting and coding have in common? Dr. Karen Shoop tells us about it, during this podcast, at minute 11:27. In the 3rd lecture, which was broadcast on BBC 4 on the 31st of December, Professor George showed how motors can be used to create a robot orchestra, with Mortimer on drums. Play an intro video here. IWCS 2015 will be held at Queen Mary University of London, UK on 14-17th April 2015. IWCS is the bi-yearly meeting of SIGSEM, the ACL special interest group on semantics. Computer scientists at QMUL have taught a computer how to create magic tricks using artificial intelligence. Researchers gave a computer program the outline of how a magic jigsaw puzzle and a mind reading card trick work, as well the results of experiments into how humans understand magic tricks, and the system created completely new variants on those tricks which can be delivered by a magician. What makes live performance compelling? How does it differ from relays or recordings? This event explored the emergence of new techniques for capturing, understanding and instrumenting the dynamics of live audience interaction; both performer-audience and audience-audience. The aim was to promote discussion of how digital technologies are transforming the experience and analysis of live events and was aimed at those creating or producing live events for audiences or consumers, and interested academics. Prof. Pat Healey, Dr. Colombine Gardair, Toby Harris and Kelomenis Katevas presented the audience interaction work of the Cognitive Science Group. They demonstrated how technology can provide real-time information about people’s reactions to a live event and the new kinds of research on audience engagement that it makes possible. They also illustrated some ways in which these technologies can be used by the Creative and Cultural Industries to enhance the experience of live performance. The evening concluded with open discussion and refreshments. 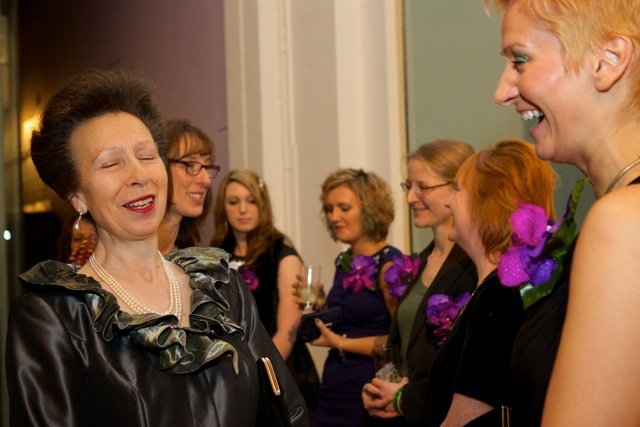 This event was delivered in partnership with Creativeworks London and Rich Mix. Along with the 3rd International Workshop on Miscommunication we ran a doctoral colloquium. The doctoral colloquium was an informal space for PhD students to discuss the ideas they are currently pursuing, their methodologies and approaches. If you or someone you know is working on miscommunication in their PhD work – please get in touch. is coming out next month! Pre-order it here! The Centre for Mind in Society will be holding an interdisciplinary funding sandpit aimed towards identifying and exploiting potential research collaborations between schools at QML. Where: The Royal Foundation of St Katherine, 2 Butcher Row, London E14 8DSWe envisage this being of particular relevance to academics and postdocs but any interested QML staff and students are welcome to join. Public Debate: Who Is in Control? A panel of experts from UCL, LSE and QMUL will be taking part in a Question Time public event hosted at Queen Mary University of London, on Tuesday, March 25th. You can read more about it and book a place here. In preparation for the event, we are collating questions on the topic of control, which will form part of the debate. If you wish, you can contribute a question to the debate – it will take no more than one minute. We are pleased to announce the launch of a new Electroencephalography (EEG) laboratory at Queen Mary, University of London. The new lab is the result of a collaboration between the School of Biological & Chemical Sciences (SBCS) and the School of Electronic Engineering and Computer Science (EECS) and was funded partly by an EPSRC equipment grant for Early Career Researchers. The lab will be run by Marcus Pearce (director) from EECS and Tiina Eilola (deputy director) from SBCS. Where: Informatics Hub on the 3rd floor of the Peter Landin (CS) Building. Stimulus PC running e-prime, mirroring the participant’s display. 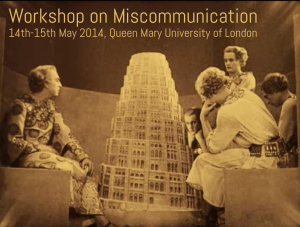 We are pleased to announce that QM’s CogSci group will host the 2014 International Workshop on Miscommunication. The workshop builds on two previous meetings at QMUL in 2006 and as part of the Cognitive Science conference in Stresa in 2005. The workshop will bring together researchers from around the world to discuss the notion that processes of detecting and dealing with miscommunication are key to explaining how communication is possible in principle and how it is effected in practice. More information is available on the workshop microsite. 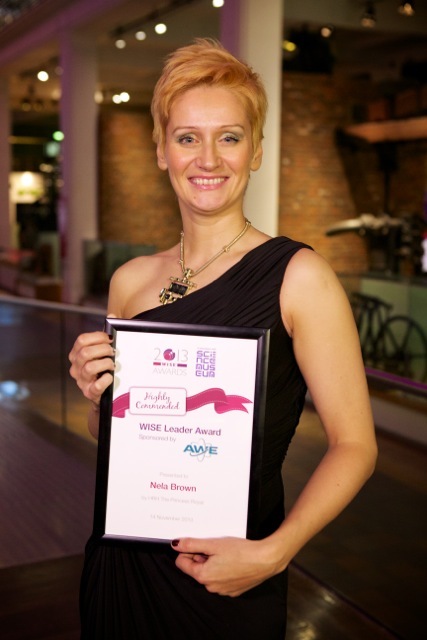 PhD candidate Nela Brown received the WISE (Women in Science and Engineering) Award in the Highly Commended WISE Leader category, in recognition of her work with G.Hack, WISE@QMUL and Flossie. 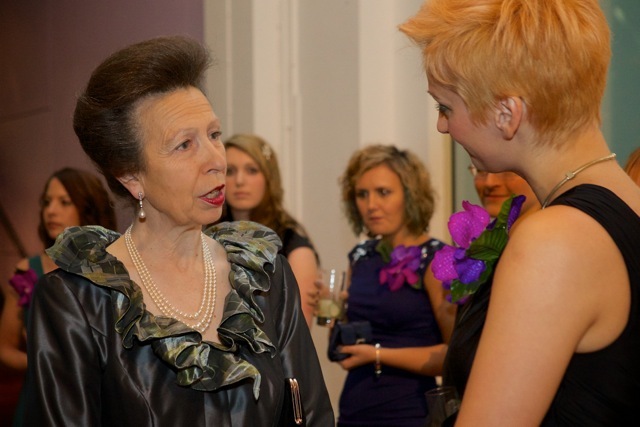 The award was handed by Her Royal Highness The Princess Royal during the November 15th ceremony in London. New paper on causal inference using multiplicative STDP + plasticity rules, by Chrisantha Fernando. What makes a good perform ance? 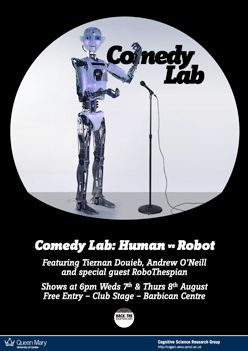 By pitting stand-up comics Tiernan Douieb and Andrew O’Neill against a life size robot in a battle for laughs, researchers at Queen Mary, University of London hope to find out more — and are inviting you along. 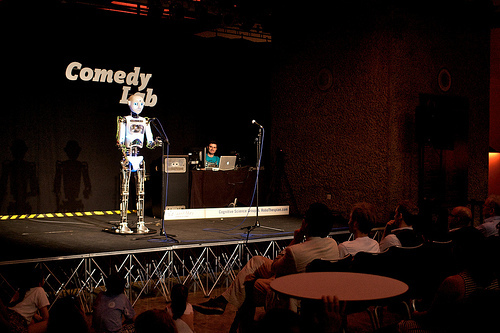 A collaboration between the labs of Queen Mary’s Cognitive Science Research Group, Robothespian‘s creators Engineered Arts, and the open-access spaces of Hack The Barbican, the researchers are staging a stand-up gig where the headline act is a robot as a live experiment into performer-audience interaction. This research is part of work on audience interaction being pioneered by the Cognitive Science Group. It is looking at the ways in which performers and audiences interact with each other and how this affects the experience of ‘liveness’. 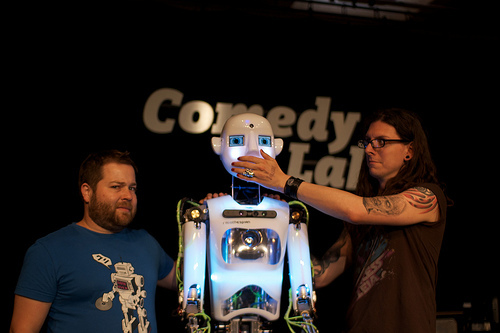 The experiment with Robothespian is testing ideas about how comedians deliver their material to maximize comic effect. (For more on QMUL audience interaction activities, see the 2012 Ends of Audience workshop below). BCS-HCI 2013 Workshop – deadline extended! We received a number of high quality submissions so far and would like to fill up the workshop capacity to ensure we get as diverse input as possible from researchers using different qualitative methods, different ways of representing qualitative data and different ways of translating those representations into the design of technologies. The workshop participants will work in groups using different data sets with the aim to assess the challenges of translating qualitative findings into design and, through collective discussion, propose a starting point for a framework of possible solutions. Extended deadline submission requirements: Up to a maximum of 1 A4 page (500 words) to include method/s of qualitative analysis you have employed and list of issues you have encountered when moving from qualitative data to design. 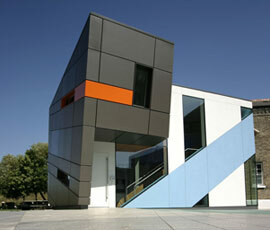 Conference venue: Brunel University, London, UK. Submission format: BCS ewics format to be submitted in pdf by email to Nela Brown. Reviewing process: All submissions will be reviewed by at least two members of the programme committee. There will also be a meta review process to ensure consistency. Workshop outcome: All accepted contributions will be archived online through the workshop website and the organizers will investigate the possibility of workshop contributions being extended to form a special issue of a relevant journal, such as the International Journal of Human-Computer Studies or Interacting with Computers. The one-day workshop celebrated the successful completion of our research project Information and Neural Dynamics in the Perception of Musical Structure, funded by the Engineering and Physical Science Research Council (EPSRC). The project included members at Queen Mary, University of London and Goldsmiths, University of London. in addition to members of the IDyOM team. Attendance was free. Location: Arts 2, Queen Mary University of London. Submissions: 300 word abstract by email before Jan 30th 2012, Midnight GMT. People in audiences act: they talk, clap, heckle, sigh, inhale, exhale, rustle, twitch, tweet, dance, flirt, laugh, whisper, shuffle, cough… in doing so, they interact. There is a structure and dynamic to these responses which is central to the experience of being in a live audience. This workshop brought together researchers and professionals with interests in performance, interaction and technology who are working on understanding, instrumenting or experimenting with these dynamics, and the shifting ends of audience that they reveal. technologies and methods for enhancing and manipulating audience engagement.